We need to enforce our trade laws and crack down on cheaters. That’s something President Trump has said he agrees with me on, and I’m holding him to his promises on trade. When Senator Portman and I met with the President earlier this month to talk about our steel and trade policy, I made it clear that trade enforcement must be a priority. I also made it clear that we need quick action to address China’s steel overcapacity. For far too long, our steel industry has been drowning under a flood of unfairly traded steel imports that threaten Ohio jobs. Last year, the administration launched an investigation into the impact of certain steel imports on national security, known as a 232 investigation. But it took nine months to complete that investigation, and even after the Commerce Secretary announced his findings, the administration has yet to take action. This delay is allowing foreign competitors to keep dumping steel into the market, and Ohio steelworkers don’t need a report to tell them they are losing jobs to Chinese cheating. That’s why Senator Portman and I have been demanding action on the 232 investigation and continued to make that point during our White House meeting. We’ve seen what we can achieve for Ohio businesses and Ohio workers when we actually enforce our trade rules. Last month, the administration followed calls from myself and Senator Portman to stand up for the 3,500 Ohio workers at Whirlpool whose jobs have been threatened by cheap imports from countries like China, Mexico, and Korea. Because of that victory, Whirlpool is now able to add 200 new jobs at its plant in Clyde. I thanked the president for his administration’s action in that case and urged him to take the same hard line when it comes to trade cheats in steel and other industries where unfair competition threatens American jobs. Finally, I pressed the president to continue North American Free Trade Agreement (NAFTA) negotiations and stand strong for Ohio workers and Ohio companies. We know what we need to do to secure the best deal for American workers in NAFTA renegotiations, and under the leadership of President Trump’s United States Trade Representative, Robert Lighthizer, I believe we can get there. As I told the President at the White House, if we get a deal that puts Ohio workers first, not only will I vote for it, I will help him get the other votes it needs to pass. I will keep working with this Administration to build a better trade agenda for Ohio. 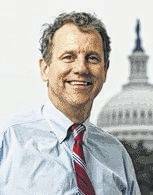 Sherrod Brown is a Democratic United States Senator representing Ohio.